A lot has been written about the intriguing prophecy of the three days of darkness but one needs to sift through them carefully lest one succumbs to exaggerated and sensational ideas and, more importantly, to serious doctrinal errors. And with regard to this subject, separating the chaff from the wheat is indeed a daunting task. What does the Catholic Church say regarding prophecies? So in order to start on the right footing, it would be wise and salutary to inform ourselves with what the Church has to say about this topic. As the term is used in mystical theology, it applies both to the prophecies of canonical Scripture and to private prophecies. Understood in its strict sense, it means the foreknowledge of future events, though it may sometimes apply to past events of which there is no memory, and to present hidden things which cannot be known by the natural light of reason. St. Paul, speaking of prophecy in 1 Corinthians 14, does not confine its meaning to predictions of future events, but includes under it Divine inspirations concerning what is secret, whether future or not. As, however, the manifestation of hidden present mysteries or past events comes under revelation, we have here to understand by prophecy what is in its strict and proper sense, namely the revelation of future events. The knowledge must be supernatural and infused by God because it concerns things beyond the natural power of created intelligence; and the knowledge must be manifested either by words or signs, because the gift of prophecy is given primarily for the good of others, and hence needs to be manifested. It is a Divine light by which God reveals things concerning the unknown future and by which these things are in some way represented to the mind of the prophet, whose duty it is to manifest them to others. The Church considers the Apocalypse as Divinely inspired and remains to be the last prophetic work She acknowledges as such. Though the prophetic spirit continued through the centuries, the Church has never promoted any other prophetic work even as she proclaimed countless saints who were gifted with prophesy. The Church prudently gives ample latitude as to the acceptance or rejection of particular or private prophecies based on evidence for or against them. The Catholic faithful’s attitude should be that of prudence and balance always being careful and slow in accepting or rejecting them especially when they come from trustworthy sources and do not contradict Catholic doctrine and morals. Veracity or accuracy of their fulfillment remains to be the litmus test to which all prophecies are to be judged. The character of these prophecies covers a wide gamut ranging from pious anticipations of Providence; to events in the lives of saints; to the fate of nations; to the popes and the papacy; and to apocalyptic catastrophes leading to the end of the world. They may sometimes be realized in part and in part may even run contrary to events. Due to the conditional nature of some of them, they may or may not be fulfilled. The Fatima prophecies fit exactly into this category when Our Lady spoke of a terrible chastisement if men do not repent and amend their lives but she also gave hope by promising that in the end Her Immaculate Heart will triumph. Then from the sixth hour, there was darkness over the entire earth, until the ninth hour. (Mt 27:45). And when the sixth hour came, there was darkness throughout all the earth, until the ninth hour. (Mk 15:33). But it was almost the sixth hour, and there was darkness in the entire earth, until the ninth hour. (Lk 23:44). So as not to belabor the point, it suffices to say that there are several more scriptural texts referring to days of darkness and that there is solid ground upon which later prophecies, symbolic or otherwise, were based. Of the more recent revelations about these days of darkness, we will mention only two: those of Blessed Anna-Maria Taigi and Venerable Elizabeth Canori-Mora. 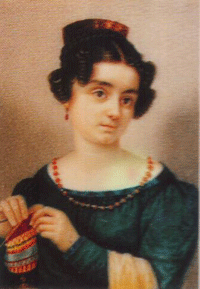 Though an ordinary housewife and mother, Blessed Anna-Maria Taigi led an exemplary spiritual and Christian life that gained her the reputation as one of the greatest saints of all time. She experienced frequent ecstasies, performed miraculous cures, read hearts, foretold deaths, and predicted the coming of future events. She foretold the first two world wars that wreaked havoc in the twentieth century. Eighteen years after her death, her body remained supple and incorrupt. Amid praises, Pope Benedict XV beatified her on May 20, 1920. "All the enemies of the Church, whether known or unknown, will perish over the whole earth during that universal darkness, with the exception of a few whom God will soon convert. The air shall be infected by demons who will appear under all sorts of hideous forms." "Religion shall be persecuted, and priests massacred Churches shall be closed, but only for a short time. The Holy Father shall be obliged to leave Rome." 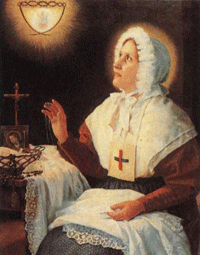 Blessed Elizabeth Canori Mora3 was born in 1774 and lived in Italy until her saintly death in 1825. Thanks to her confessor, her revelations were preserved in hundreds of pages of her own writings. Today, the Trinitarian Fathers at San Carlino, Rome hold her manuscripts for safekeeping in their archives. These writings were meticulously examined at length as a safeguard against doctrinal errors when Pope Blessed Pius IX authorized Elizabeth Canori Mora’s cause for canonization to proceed. Elizabeth Canori Mora was beatified in 1994. On the feast of Saints Peter and Paul, June 29, 1820, she saw Saint Peter descending from heaven, robed in papal vestments and surrounded by a legion of angels. With his crosier he drew great cross over the face of the earth, separating it into four quadrants. In each of these quadrants, he then brought forth a tree, sprouting with new life. Each tree was in the shape of a cross and enveloped in magnificent light. All the good laity and religious fled for protection underneath these trees and were spared from the tremendous chastisement. “Woe! Woe to those unobservant religious who despise their Holy Rules. They will all perish in the terrible chastisement together with all who give themselves to debauchery and follow the false maxims of their deplorable contemporary philosophy! It is clear from the above two revelations that God had forewarned mankind of a great and terrible chastisement. Perhaps they seem far-fetched and severe, but in face of so much impiety; blasphemy; desecration; corruption and immorality pervasive in our times, it wouldn’t be superfluous to surmise that the world indeed deserves such grave punishments. Unfortunately, man has progressively slid down the slippery slope of pride and arrogance and has gone from worse to worst! More importantly it is crucial to note that Our Lady of Fatima echoed the same sentiments when she warned us at Fatima in 1917, thus giving support to these two previous prophecies. A striking similarity, however, occurs between Our Lady’s message of hope regarding the triumph of Her Immaculate Heart and the two above prophecies. “The small flock of faithful Catholics who had taken refuge under the trees will be brought before Saint Peter, who will choose a new pope. All the Church will be reordered according to the true dictates of the holy Gospel. The religious orders will be reestablished and the homes of Christians will become homes imbued with religion. “After the three days of darkness, Saints Peter and Paul, having come down from heaven, will preach throughout the world and designate a new pope. A great light will flash from their bodies and will settle upon the cardinal, the future Pontiff. Then Christianity will spread throughout the world. Whole nations will join the Church shortly before the reign of Anti-Christ. These conversions will be amazing. Those who shall survive shall have to conduct themselves well. There shall be innumerable conversions of heretics, who will return to the bosom of the Church; all will note the edifying conduct of their lives, as well as that of all other Catholics. Russia, England, and China will come to the Church." Thus, while the world faces a fearsome and terrible destruction in light of mankind’s insolence and impiety, God assures us that He will not abandon those who are faithful to Him. Our Lady gave us the remedy at Fatima by asking for the daily recitation of the Rosary; the establishment of the First Five Saturday devotions; devotion to Her Immaculate Heart; a prayerful life; penance and amendment of life. These requests remain ever relevant and urgent. And we must continue to heed Her maternal warnings. Amid the confusion of our days, let us remain steadfast and continue to hope, confide and turn to Our Lady, who is our Mother of Good Counsel and our Confidence.